I totally want to snag these Skinny Slouch Loved jeans by Current/Elliot ($215 value) for myself, but it's your lucky day! Chickdowntown has generously offered to let me give away a pair to one fabulous lookrichbitch reader! For one chance simply leave a comment! You can get additional entries by following my blog and/or Twitter! You'll get one entry for each - just let me know when you've added me! (And if you're already following me, just let me know and you'll get those extra entries too!) Spread the word! Contest ends on July 8, 2009 at midnight PST. US residents, please. I'm so excited! Good luck to you all! I know I've been MIA lately and there's really no excuse other than I've been busy shopping and not focusing on you, my darling readers! First there was an Elizabeth & James top. It has a crazy deep V and Hunny Bunny suggested I wear something bright underneath. Wow. Who would've thought he'd be into "a pop of color" too?! 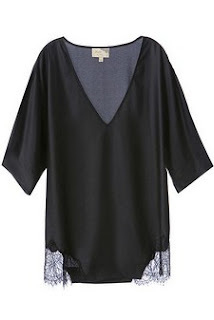 Then came this Rag & Bone reversible top (you can wear it four ways!) It's a soft navy blue cotton on the flip side. I've been wearing it over my American Apparel racer back tank dress. Actually, I'm not sure it's even a dress.. Maybe it's just a long tank. And I am in loooove with my new Marc by Marc Jacobs little jacket that I picked up at the Rack! It's actually cotton so I've been wearing a lot on breezy days. Can't wait to try it with shorts! Anyway, to make up for being such a deadbeat, I wanted to let you know that I'll be having a fantastic giveaway soon! Here's it hint: It's sponsored by chickdowntown and it's actually something that I've been wanting for myself. See? I'm not completely selfish. it's like the happiest (un)birthday! I'm ecstatic! I'm filled with glee! I'm bursting with joy! What a wonderful way to end a stressful week! 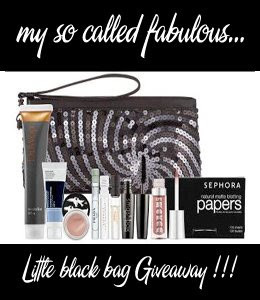 I never thought I'd stand a chance to win my so called fabulous life's Little Black Bag Giveaway - filled with goodies from Sephora... Dreams do come true! Is this real? Is Jimmy Choo really doing a line for H&M? The answer is: YES! Okay, I still haven't returned to Momo for those crazy harem pants because I can't justify paying $200+ for such a novelty. I did however find these Silence & Noise cropped pants at Urban Outfitters. While they're not exactly the same, they're more in my price range for trendy items. Don't you agree? 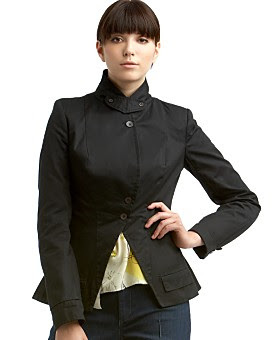 Besides, there are so many other things I could be spending my money on... like this Rag & Bone wool jacket. I'm telling you. I'm obsessed with blazers. I hope I have enough willpower to wait until it goes on sale.. Pray for me. should i join a harem? I've been on the fence about getting a pair of harem pants. Yes, I suppose I am rather slow to join this bandwagon - there are just too many memories of Too Legit To Quit for me to be so hasty. Good thing I didn't bring my wallet. AnywishIhadallthemoneyintheworldtobuycrazypants, they have a high elastic waist with ample pleating (in a non-pooch enhancing way) and a self-tie belt. The pants could almost pass for a skirt. Dammit. They were pricey though. But I want them. They're on hold until Tuesday. To celebrate this joyous occasion, HB's office mates decided to hold a canned food drive in his honor because he's so damn skinny! (In case you can't read the banners, they all say "I am hungry, please feed me!") They're so thoughtful. I sure hope he gets some nibblets and chicken noodle soup. 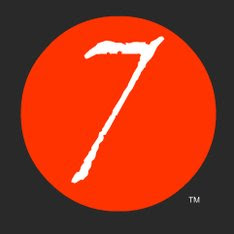 A couple months ago, I received a coupon for a free haircut at Seven Salon in Seattle. As luck would have it, I now have three coupons to give away! If you live in the Seattle area and want one of the coupons, be one of the first three to leave a comment and I'll contact you for your address. The coupons say they expire on June 25th and are good Sunday - Thursday only, but word on the street is that they're pretty flexible with scheduling. You just have to go with the specific artist listed on the coupon. Just remember to tip well since you're saving at least $50! 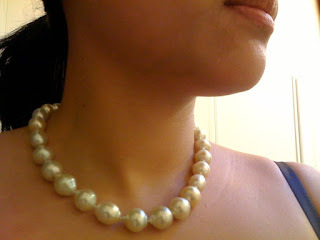 Read more about my new baubles here. I've come to realize that I've developed an addiction to blazers. I blame Tiffany at I Am Style-ish and my littlest friend em. Compared to those two, I clearly have no idea what I'm doing when it comes to blazers. I just know that I like what I see (on them anyway) and am trying to follow in their itsy-bitsy footsteps. I picked up this twenty8twelve blazer in a warm khaki color at the Rack. It was 85% off. My shoulders are pretty broad though so I think I'm going to have the shoulder pads taken out. They're just a little too puffy for my liking but otherwise a fun, casual jacket. I think I'll be able to wear it a lot on cooler summer nights, if I go out... Which is like, you know.. NEVER. But still nice to think about, no? Once in a blue moon, I'll actually have free Saturday. I normally help my folks on at their store (yes, I pretty much have 3 jobs right now...) I decided it would be a perfect day to hang out with a couple couple of my cousins whom I hadn't seen in a long time. We had breakfast and got pedicures and went shopping! If that doesn't sound like a perfect day, I don't know what does! I miss doing girlie things with my girls. So during this outing, I spied this adorable dress by sweetees. Normally, I would wait until it was at least 50% off but I guess I was in such a sunny mood, I had to have it! Thankfully, my cousin had a coupon so I still didn't have to pay full price. I wore it last week and felt so pretty and fresh and bright. I received so many compliments from other fashionable people. But the one that meant the most was from one of my managers who has seriously said things to me like, "Should I wear my blue fleece vest with my plaid flannel shirt or my Gortex jacket?" Or "Looks like it might be cold on the way home some I better put some socks on.."
He was wearing Teva sandals!!! He said I just looked like summer! Don't worry! I'm still here! Barely. Life has been a little crazy lately. This whole wedding planning thing is totally putting a damper on my (shopping) lifestyle. I've only been paying the deposits for all of our vendors but I'm seriously dreading the day we have to pay the balance! Eep! 5 months and 2 days! And I've been working a lot and working out a lot. And I don't know what to do about Hunny Bunny's upcoming birthday. But I do need your opinion. 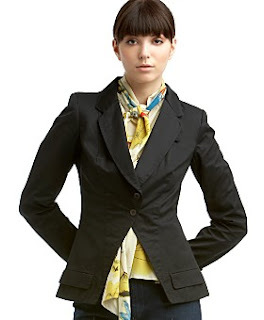 I bought this Elizabeth & James blazer during the Nordstrom Half Yearly Sale. It was 60% off. Obviously I won't be able to wear it for several months still but do you like it? The ruffle scarf is removable so it's pretty much a normal blazer - tho the back side does swoop down, which I kinda like since it covers my bum. I really want to wear it now, but I shouldn't complain about the great weather that we've been having, right?